Sheriff Knight is allowing a cold blooded killer the chance to strike another elderly victim. Sarasota Medical Examiner, Russell Vega, chose to speak for the corrupt instead of a murder victim. Colonel Hoffman used his knowledge and training as a police officer and attorney to thwart justice. 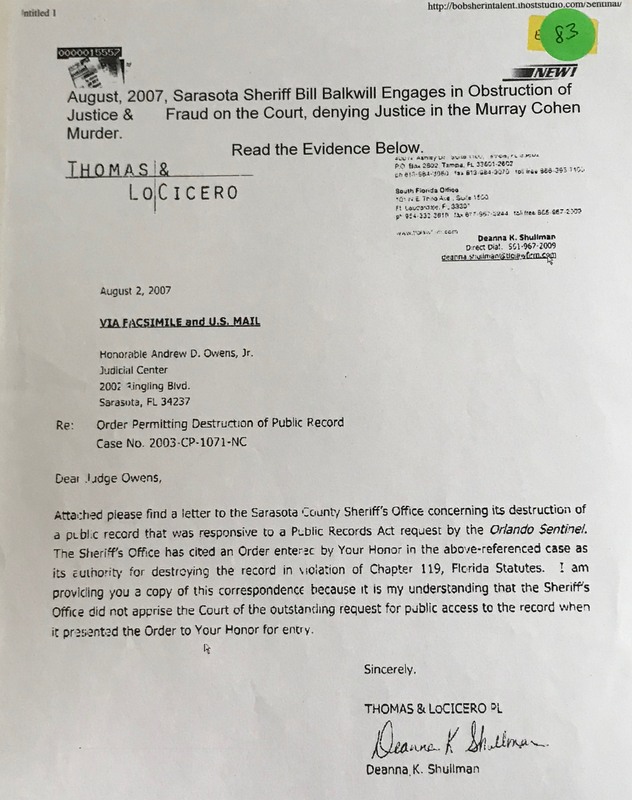 Under the leadership of former FBI Director, Robert Mueller, the Sarasota Sheriff's Office was able to obtain a false audio report which has blocked justice from being served. Nakasone created the false audio report which has been used to deny justice for Murray Cohen's murder. He was also a former LA Police Officer. Nakasone Claims Amurrio is Saying "Mi Amor"
Listen for yourself and decide if she is saying "mi amor" or "give up"